Local public libraries are irrelevant, thanks to the rise of Starbucks, Netflix, and Amazon. They should be replaced with Amazon stores to save taxpayers money and boost Amazon stock. So said Panos Mourdoukoutas in a story that was posted on Forbes.com. "At the core, Amazon has provided something better than a local library without the tax fees," wrote Mourdoukoutas, a Forbes contributor and professor and chair of the Department of Economics at LIU Post in NY and teacher at Columbia University, according to his online bio. "This is why Amazon should replace local libraries. The move would save taxpayers money and enhance the stockholder value of Amazon all in one fell swoop." 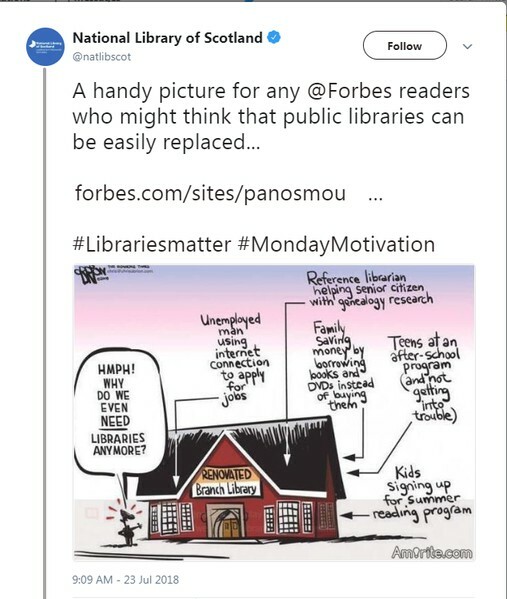 Mourdoukoutas also wrote, "To be fair, library surveys do not seem to confirm the idea that public libraries don’t have the value they used to." More data is needed, he concluded. "Forbes advocates spirited dialogue on a range of topics, including those that often take a contrarian view," a spokesperson said. "Libraries play an important role in our society. This article was outside of this contributor's specific area of expertise, and has since been removed." For many, the outrage was based on Mourdoukoutas' suggestion that everyone has the ability to purchase books instead of borrow or have a Netflix subscription. It is that piece of the proposal that YALSA focused on in a blog post. "But perhaps what is most disturbing about his suggestion is that he completely ignores the fact that there are millions of Americans living in poverty who cannot afford to purchase books and other materials, and who do not have access in their homes to current digital tools or high speed Internet..." YALSA president Crystle Martin wrote. "Libraries bridge this gap for low income youth, providing access not only to digital tools and the Internet, but trained adults and peers who can help them learn how to use these tools efficiently, ethically and effectively. It is distressing that the increasing wealth gap in the country seems to be of no concern to Dr. Mourdoukoutas." Others took personal offense to the ignorance of the services librarians provide. Kristina Holzweiss, 2015 SLJ School Librarian of the Year, tweeted: "I see you are a professor @LIUPost. I am a product of The Palmer School at @LIUPost. You have belittled my education, profession, and honors. Advocate for school librarians and libraries - equity for all!" The National Library of Scotland tweeted in response with the hashtag #LibrariesMatter, which had many Twitter users jumping in to share why libraries matter to them. But this story upset those beyond the library world, too, especially when the writer tried to take on his Twitter critics, particularly those who talked about the free services provided by libraries. In a tweet he pinned to the top of his Twitter page, he wrote, "Let me clarify something. Local libraries aren't free. Home owners must pay a local library tax. My bill is $495/year." His clarification was met with a fact-filled thread from Charlotte Clymer, who did the kind of research many suggested Mourdoukoutas did not. "So, to clarify... I'm not sure where Dr. Mourdoukoutas got this figure," Clymer tweeted. "I have to assume he has a literal itemization on a local tax bill that says 'Public Library -- $495.' But just for fun, let's see where that $495 goes. For $1.36 a day, what does Dr. Mourdoukoutas get?" Clymer found out that Mourdoukoutas lives in New York and his local library would be the Plainview-Old Bethpage Public Library. She then went through the library's schedule and identified all the library programs and services available to taxpaying residents of the community, even backing up that information with screenshots of board meeting minutes and a schedule of future meetings for Mourdoukoutas to attend. Clymer ended her thread with, "Anyway, I can only hope that Dr. Mourdoukoutas learns how much his local library helps his community, how essential it is to community life, how much of a bargain it is that he gets to pay $1.36 a day for all of this. Pretty awesome. Support your local libraries." Plainview-Old Bethpage library director Gretchen Browne was thrilled with Clymer's response. "It is amazing!" Browne wrote in an email. "People piping up for libraries, and ours in particular. What wonderful publicity for one of the best libraries in the state." Browne hadn't seen the full Forbes story, which was taken down from the website Monday morning. Despite Forbes' action to quell the controversey, the response continued after the post came down. This proposal dismissing libraries as no longer relevant became an opportunity for library staff to educate the public on what they do and for supporters to share personal stories. Clint Smith, author of Counting Descent, tweeted: "While public libraries are simply an abstraction to some, for many of us they were & continue to be a sanctuary, a community, a public rejection of the notion that knowledge should be contingent on what you can afford, a place where no price can be placed on the access to ideas." He went on to share a story about a librarian who stayed two hours past the end of her shift to help him with a science fair project when he was in fifth grade. "She didn't get paid extra for that," he tweeted. "That doesn't show up on a spreadsheet when examining the cost-benefit analysis of taxpayer dollars. You can't measure that." The Forbes story did not move everyone to offer a counter narrative. As Eve Ewing, author of Ghosts in the Schoolyard: Racism and School Closing on Chicago's South Side, put it: "The fact that folks have had to spend valuable time and energy explaining and defending the function of libraries makes me sick." At the end of Martin's YALSA blog post, she had a suggestion for readers equally appalled but wanting to take action, "If you disagree with his assessment that libraries are obsolete, we encourage you to many any size donation to support YALSA's brand new Innovations in Teen Services Award. If you donate online in Dr. Mourdoukoutas' name by listing him as a 'tribute' on the form, YALSA will send him notification that he has supported libraries by way of your generous gift."